The English Admiralty's first badge, a crescent and star, was taken from the Arms of the Royal Borough of Portsmouth, the site of the principal dockyard on the south coast. King Richard the First had adopted the emblem from the standard of the Byzantine Governor of Cyprus after taking the island during the Third Crusade, and had granted it to Portsmouth as Arms in 1194. The Ottoman Turks captured Constantinople in 1453 and adopted the Byzantine crescent and star as an emblem of the Turkish Empire. Thus the crescent and star lost its Christian associations, and although it is still the Arms of Portsmouth, it was abandoned by the Admiralty in the course of the 16th century. A Harleian manuscript of 1534 notes that "The Badge of the Admyralte ys a cresante with burning fyre", but later in the 16th century Admiralty Courts were using an anchor as their mark on detained goods. An anchor was the emblem of St Nicholas, patron of sailors, and in Christian symbolism a sign of security and hope. An example of the crescent and star badge can be seen on the special ensign of the Portsmouth Yacht Club, 1936 to 1939. Flag on Ark Royal, 1588. None of the numerous flags on the Anthony Roll of 1546 include an anchor. The first flag which featured an anchor appeared in a woodcut thought to have been made in about 1600. It depicts the 'Ark Royal', Lord Admiral Howard's flagship in 1588, at the time of the Spanish Armada. The fly of the flag is a swallow tail, and the whole of the hoist is occupied by a horizontal clear anchor with a very thin cable running through the ring. In constructing the image it has been assumed that the colours were the same as in later anchor flags. This flag is attached to the lower fore-top. Other swallow-tailed flags are, at the upper fore-top, a lion, and at the lower main-top, striped. Masthead flags are a Royal Standard at the main, St George at the fore and outer mizzen, and a rose at the inner mizzen. A St George forked pendant hangs from the bowsprit, and a banner of arms is on the main deck. The Admiral of England or Lord Admiral, later Lord High Admiral (LHA) was not a rank but an office created in 1408 by combining the responsibilities of Admirals that had previously assembled the Northern, Southern and Western Fleets. He acted as the King's deputy at sea, and since the later part of Henry VIII's reign had flown the Royal Standard (Henry VIII) when at sea. Lord Admiral Lisle's Instructions of 10 August 1545; "Item the lord admirall shall beare one banner of the Kinges Majts armes in his mayne topp and one flag of Saint George crosse in his fore topp". Instructions drawn up by Sir John Hawkins towards the end of Elizabeth's reign contain the same provision. "Item the Ld. Admirall shall beare a flagg of the Armes of England upon the Top of his Maynemast and a flagg of St.George on the foretopmast." After 1635 the Admiral of a Grand Fleet, who was not the LHA, nor of royal lineage, flew a Union Jack at the main instead of the Royal Standard. A Red Flag at the main, which, theoretically, was the flag that the Admiral of a Grand Fleet who was not LHA should have flown, was hoisted only when he was not on board. In 1638 the Commission was dissolved and the Duke of York, (future James II) was named Lord Admiral for life. During York's infancy the office was granted to Algernon Percy, Earl of Northumberland, as acting substitute. He adopted a seal in which a cable attached to the ring of an anchor ran in curves and loops around outside the anchor ending just short of the ring on the opposite side. A flag based on the Seal may have been introduced at this time by Northumberland as an alternative to the Royal Standard. However this is not certain and it may not have come into use until after the Restoration of the Monarchy. During the Civil War both the Earl of Warwick, appointed LHA by Parliament, and the Princes Charles and Rupert, who at different times commanded those ships that were loyal to the King, flew the Royal Standard, which since 1603 had been the previous standard quartered 1 and 4, with Scotland 2, and Ireland 3. After the Civil War, and the execution of King Charles in 1649, an Act of Parliament repealed the powers given to the LHA and the office was conferred on three Commissioners, any two of which could exercise the executive power afloat of the LHA. Northumberland's anchor and cable seal, without the garter and coronet, was still used by the Committee of the Admiralty and Navy, but an Order of 5 March 1649 stated that "the flagg that is to be borne by the Admirall vice Admirall Rere Admll be that now presented, viz: the Armes of England and Ireland in two severall Escotchons, in a red flagg wth in a Compartiment (or)". (The word "or" [gold] has been added to the original text but is thought to have been a contemporary addition.) A variation of this flag which had no compartment but did have a garland around the two escutcheons, was probably used in lieu of the Royal Standard of the LHA by the General of the Fleet. A flag of this description was found in a chest at the house of the Admiral Superintendant at Chatham, and is now in the National Maritime Museum. A photograph of the flag is on page 73 of Timothy Wilson's "Flags at Sea". In 1654 England and Scotland were united and the Lord Protector's Standard consisted of Cromwell's personal Arms, a white lion rampant on a black shield, as an escutcheon upon the quartered arms of England (1 and 4), Scotland (2), and Ireland (4). See "Flag of the Protectorate 1653-59". In May 1658 this flag became the Standard of the General of the Fleet. "That the Standard for the Generall of his Highness ffleete be altered, and doe beare the Armes of England, Scotland, and Ireland, with his Highness Escutcheon of pretence, according to the impression of the Great Seale of England." After the Restoration of the Monarchy in 1660 the Anchor Flag had the general appearance of Northumberland's Seal, in which the cable was attached to the anchor ring and taken completely around clear of the anchor in a number of loops and curves. In 1661 a contractor was paid 50 shillings "ffor shading the Standard and Ensigne and Jack with a ancor," 110 shillings "ffor sowing silke and cloth for the sockett and markeing the Ensigne with the ancor and cable," and 90 shillings "ffor sowing silke and cloth for socketing & markeing the flag with a ancor and cable." Two variations of this flag were used by James, Duke of York, after the Test Act of 1673. The Act prevented Roman Catholics from holding office under the Crown and forced James to relinquish the office of LHA. However he remained Admiral of Scotland, Wales, Ireland and Tangier and flew the flag of the Admiral of Scotland, a white flag with a blue horizontal anchor surrounded by a looping cable (Insignia Navalia by John Graydon), and possibly also a red flag with a blue anchor and yellow cable (flag marked 'Duke of York' in William Downman's notebook of 1685, reproduced on page 68 in 'Flags at Sea'). Just before his death in 1685, Charles II revoked the commission, and the office of LHA was assumed by the Crown. When the Duke of York succeeded to the throne as James II he retained the office of LHA and in the words of Samuel Pepys, Secretary to the Admiralty, placed "a crown over the anchor as being himself his own Admiral." This flag was flown from the mainmast of the royal yacht, and the same emblem also appeared in the fly of the yacht's ensign; a Red Ensign with a St George's cross canton. The images here are based upon an illustration of the ensign in 'Flags at Sea' page 23. The cable now runs through the ring and then, with just a single loop, down each side of the anchor passing underneath the stock and arms. This, with the cable alternately passing over and under the stock and arms, has been the general arrangement of the cable and anchor ever since. Since the Restoration the anchor and cable flag had been called variously, "ensign (or flag) with anchor and cable", "flag red with a yellow anchor and cable in the fly", "red standard with the anchor in it", or "the anchor flag", and it was not until 1686, in a table of flag usage drawn up by Samuel Pepys, Secretary to the Admiralty, that the Anchor Flag was described as being specifically that of the LHA. However this was the case only when the King was in the Fleet aboard another ship, and in all other circumstances the flag of the LHA was the Royal Standard. When the office was in commission and there was no LHA, the Anchor Flag was the flag of the Commissioners of the Admiralty. "Admiralty Office, 22 March 1691. Gentlemen, We do hereby require and direct you to cause a fitting red silk flagg, with the anchor and cable therein, to be provided against Tuesday morning next for the barge belonging to this Board. Your affectionate friends, C.C (Lord Cornwallis), J.L. (John Leake), etc.."
The Earl of Pembroke was appointed LHA in 1701 and issued two warrants to the Navy Board directing it to "provide a Standard for my Lord High Admiral, the Earl of Pembroke, such as is usually worn by the Royal Family", and "a silk flag for the head of his boat such as properly belongs to the Lord High Admiral of England". However before the warrants could be executed William III died and the new monarch, Queen Anne, deprived the LHA of the right to fly the Royal Standard. Pembroke now ordered "so many of these flags which particularly have been worn by the Lord High Admiral of England &c., by vertue of his Office, as may be necessary for my Ship and Boat". Thus the Anchor Flag now became the only flag of the office of LHA which effectively ceased to be a single person after 1702, when a Declaratory Act (2 W&M, sess.2, c.2) stated that all authorities, jurisdictions and powers which by Act of Parliament or otherwise had been lawfully vested in the LHA of England, should appertain to the Commissioners for executing the office for the time being, to all intents and purposes as if the said Commissioners were LHA of England. The office has been in commission ever since 1709, apart from three years when the Duke of Clarence was appointed LHA until he became King William IV in 1830. Some 18th and 19th century publications include a British flag with a vertical foul anchor, and entitled either "Vice Admiral" or "Admiral". The flag is similar to the current Admiralty Board Flag. The flag does not correspond to the ship or boat flag of a naval officer with an admiral's rank, but was probably the flag of Vice Admiralty courts that dealt with judicial matters of a maritime nature in the twenty maritime counties of England, in North and South Wales and in the four provinces of Ireland. A Vice Admiralty of Norfolk and Suffolk was instituted in 1536, but a comprehensive scheme for all coastal counties was not developed until the reign of Elizabeth I. In 1863 the Registrar of the Admiralty Court noted that the offices had been purely honorary for many years. c1700. C.Dankerts. Yellow or white (?) on red. "English Admirals Flag"
1813. Brightly & Childs. White on blue. "Vice Admiral". The flag of the Lord High Admiral is also shown as white on blue instead of yellow on red so the colour of the Vice Admiral flag is possibly a similar error. 1848. Norrie & Hobbs. Colour not known. "Vice Admiral". 1876. Siebmacher [g2h78]/gri78] Yellow on red. "Vizeadmiralsflagge, die keiner Escadre angehort" (with an umlaut over the o) which Babel Fish translates as, "Vice Admiral flag, no Escadre concerning place"
The requirement to fly the Anchor Flag, Royal Standard and Union Jack, from the mastheads of a ship in which the sovereign embarked, was inserted into King's Regulations by an Admiralty Circular of 4 July 1833. "The Royal Standard is to be worn on board any of HM's ships or vessels in which His or Her Majesty shall embark, and at the same time the flag of the Lord High Admiral shall be hoisted at the fore-top-gallant masthead and the Union Jack at the mizzen-top-gallant masthead, or in a small vessel the said flags shall be displayed at the most conspicuous part of the ship or vessel." Previously the regulations had referred to the Royal Standard and LHA Flag separately. 1824 Regulations for HM Service at Sea. Ceremonies and Distinctions. III. Flags. "1. The Royal Standard is to be worn on board any of His Majesty's Ships and Vessels in which His Majesty, or any Member of the Royal Family, shall embark. 2. The Lord High Admiral's Flag is to be worn on board any of His Majesty's Ships or Vessels in which the Lord High Admiral, or the Commissioner's for executing the Office of Lord High Admiral, shall embark." The three flags had sometimes been flown together in the 17th century after the Restoration of the Monarchy, but probably only when justified by the presence in one ship of, not only the King, but also the Lord High Admiral, and another person of note, at the same time. There is no undisputed occasion, from this period, when it was done to mark the presence of the King alone on board ship, although this may have happened on the royal yachts, and the three flags together may have become part of the normal suite of colours for a royal yacht. During the 18th century the three flags were sometimes flown together to celebrate royal anniversaries. A particular example was noted in the log of the ship 'Centurion', "30 October 1750, hoisted the Anchor & hope, standard and union, it being the Birth Day of His present Majesty", and by the early part of the 19th century it had become common practice for flagships to fly the three flags on all royal anniversaries. The inclusion of the rule in 1833 is said to have been done in order to frustrate the Duchess of Kent. She was a keen sailor, a member of the Royal Family and, because she flew the Royal Standard, entitled to a twenty-one gun salute, which she insisted up whenever possible. The Admiralty became tired of her perpetual demands and drafted an Order in Council that led to the amendment of the regulations. The King or Queen flying the three flags were then entitled to a twenty-one gun salute, but other Members of the Royal Family flying only the Royal Standard, were entitled to only nineteen guns. Not a particularly credible explanation, but it was the one given to Lord Louis Mountbatten in 1961 by the Head of the Historical Section at the Admiralty. King Louis XVIII returned to France from England in the royal yacht 'Royal Sovereign' on 24 April 1814. A painting of the event by Nicholas Pocock shows the Anchor Flag at the foremast, a white flag, which is presumably the French Royal Standard, at the mainmast, and the Union Jack at the mizzenmast. When the Sovereign embarked in a two masted merchant ship just two of the three flags were flown, the Anchor Flag from the forward mast and the Royal Standard from the after mast. The Royal Yacht 'Britannia', launched in 1953, was fitted with three masts so that all three flags could be flown. In 1953 the Admiralty Archivist wrote that the Union Jack, when flown with the Anchor and Standard represented the King/Queen of Great Britain, and that in an Australian or Canadian ship, the Australian or Canadian National Flag would be flown at the aftermost mast instead of the Union Jack. However "relevant authorities" (?) stated that the Union Jack would still be flown at the after mast, but that the Australian or Canadian National Flag would be flown at the jackstaff instead of the Union Jack. When the Queen visited Australia the three masthead flags flown on "Britannia" were the Anchor Flag, the Queen's Personal Flag for Australia, and the Australian National Flag, with the Union Jack and White Ensign on their respective staffs. Similarly in Jamaica the masthead flags of "Britannia" were the Anchor Flag, the Queen's Personal Flag for Jamaica, and the Jamaica National Flag. In South Africa theb-rost2.html#u three masthead flags were the Anchor Flag, the Queen's Personal " E " Flag with a ratio of 1:2, and the Union Jack. The Anchor Flag of the LHA was also the flag of the Commissioners for Executing the Office of the Lord High Admiral, known generally as the Board of Admiralty, and was flown at the main masthead of the Admiralty yacht when members of the Board were embarked. In 1850 it was also flown over the Old Admiralty Building in London until 1930 when it was transferred to the tower of the New Admiralty Building over-looking Horse Guards Parade. Initially it was flown only on Flag-Flying Days, and at half-mast on the death of Queen Victoria, of foreign royalty related by marriage to the Royal Family, and during the State Funeral of former Prime Ministers. In 1908 the flag was flown at half-mast on the death of the mother of the First Lord of the Admiralty. This came to the notice of King Edward VII who instructed Admiral Fisher, the First Sea Lord, that the flag was to be flown continuously, day and night, except when the Board as a whole were absent. In 1913 the Board decided that, despite this instruction, the flag should be flown at half-mast on the death of the Sovereign, a practice that was confirmed by Board Minute 2128 of 26 November 1925. *Actually it flew over Horse Guards Parade only a few weeks ago. The Royal Marines (RM) were performing the "Beating the Retreat" ceremony in honour of Prince Philip's birthday (he is their Captain General), and HM The Queen had come along as well. This posed a protocol problem as the parade was in honour of Prince Philip but as the Queen was present the Royal Standard would normally have been flown. The solution was to use the LHA flag to represent the Queen (as it was a naval event) so this was broken as the Royal couple arrived, then a few minutes later when Prince Philip came down to take the salute (the Queen watched from the GOC London's office) his personal flag was broken next to the LHA's. This meant that there was only one Royal Standard flying but both the Queen and Prince Philip were represented. A clever bit of flag protocol by an RM officer. The size of the anchor relative to the size of the flag had been small in the 1845 Flag Book, much larger in Hounsell's Book of 1873, but smaller again in the Admiralty Book of 1889. In 1929 it was decided that the appearance of the flag could be improved by increasing the size of the anchor and cable. The shank was widened, and the length of the anchor increased from 1/2 to 3/4 of the length of the flag. The shape of the stock was changed, and its size increased from 1/2 to 3/4 of the flag's breadth. The cable, which had been behind both stock and arms, was altered to pass in front of the upper stock and lower arm. The correct colour of the field of the flag was disputed. The head of Naval Law thought that it should be the same shade of red as that in the Royal Standard, and not the shade of red commonly used for Admiralty Flags. W.G. Perrin, the Admiralty Librarian, maintained that it should be the same red as the Red Ensign, that being the LHA's squadron. It was, he wrote, red in the Admiralty Flag Book of 1845, but changed in the first volume printed by Hounsel c1870. He thought that logically the same red should be used in the Union Jack, Red Ensign, Royal Standard and the Admiralty Flag, but it was finally decided that the Admiralty Flag should be Pattern 65 Crimson, the same red as in the Royal Standard. In 1936 an officer of the Signal School wrote that some ship-yards flew only the White Ensign and Union Jack on a naval ship when it was launched, but that a few others flew the Admiralty Flag as well. In the 18th century it had became customary to fly the flag of the LHA on men-of-war during the launching ceremony, but the tradition died out as more ships were built by contractors in commercial shipyards. The Admiralty owned a ship when it was launched in a naval dockyard, but did not own a ship when it was launched in a contractor's yard. It was decided that the custom should be revived as the flag had been flown as decoration, and not to signify the presence of authorities. An Admiralty Fleet Order of 1938 announced the revival of a two hundred year old tradition. "At all launches of HM ships, whether dockyard or contract built, White Ensign is to be flown at ensign staff, Union Flag at jack staff, and Admiralty Flag at main masthead or equivalent position." The practice came to an end in 1964 when the Admiralty Flag became solely the flag of Her Majesty the Queen as Lord High Admiral. Car flag only 7' x 10 1/2'. In 1832 the Navy Board, whose badge had been 'gules a greater anchor between two smaller anchors or', was amalgamated with the Board of Admiralty. The National Maritime Museum which opened in Greenwich on 27 April 1937, was given permission by the Admiralty to use the design of the Navy Board badge for marking prints, drawings, books etc. In January 1957 the Trustees of the Museum asked if the badge could be used as the flag of the Museum. The Admiralty replied that permission for use of the badge could be taken to imply the use of the device complete, including its proper colours. The Trustees also consulted the Home Office who replied that there was no objection to the Museum using the badge as a flag, that the Sovereign's permission was not necessary, and that Garter King of Arms (Sir George Bellew) did not foresee any difficulty. The original significance of three anchors is not known, but the Museum decided that they should be taken to represent the Royal Navy, the Merchant Navy and the Fishing Fleet. The flag was first flown by the Museum on 8 January 1958, and then daily until 1973. When the Admiralty, War Office and Air Ministry were reorganised in 1964 explicit instructions were issued that the three Service Boards were not to fly flags. The Army and Air Force obeyed this instruction for a while, but then began to use the old Army and Air Force flags. The Navy could not do the same because the Admiralty Flag had been laid up with public ceremony, and express formal instructions, that only HM personally, when acting as Lord High Admiral, would ever fly it. The Admiralty Board decided to use the flag of the former Navy Board, which had merged with the Board of Admiralty in 1832. Its adoption was not formally promulgated, and it did not appear in Appendix 31 to Queen's Regulations (RN). It was flown on Admiralty House just once on 13 September 1966, and used only occasionally, as a car flag, when Defence Ministers visited HM ships and establishments. The image here is based on a thick, stiff felt flag in the National Archives. The white sleeve has been included in the gif because of its unusually large size relative to the flag. In February 1972 Garter, now Sir Anthony Wagner, wrote to the Ministry of Defence (Navy) that a Grant of Arms was being prepared for the National Maritime Museum, and that it was intended that the principal element in the Arms should be the old Navy Board Flag, which the Museum used with the permission of the Admiralty. He had been surprised to find that the device had been taken into use by the Navy Department without any communication with him, and he wondered whether this precluded the proposed Arms being granted to the Museum. MoD (Navy) replied that the Admiralty Board made only limited use of the flag, thought it unlikely that it would be confused with the Museum Flag, and were content for the Museum to continue using it. However Garter decided that in order to avoid any risk of confusion he would design a differenced version in which the three anchors were more widely spaced and surmounted by two sailing ships. The image above is the flag as shown in 'Flags of the World' 1978 by Barraclough and Crampton. However a Museum note about their symbols says that "The Arms were granted on 20 September 1973 and the Museum flag flown in more recent times appears to be based on the design on the red shield from the Museum's Full Achievement." On the Arms the supporters include a flag of the shield which differs slightly from the 'Flags of the World' illustration. This image is based upon an original painting of the Navy Board Flag as approved for the Admiralty Board in 1976. This image is based upon an illustration of the current Navy Board Flag. Following a suggestion that the three anchor flag might be flown on HMS Intrepid during a proposed visit by the Under-Secretary of State, the First Sea Lord decided that the old Navy Board Flag should be properly adopted as the Admiralty Board Flag. It was informally approved by HM the Queen on 3 March 1975. When Garter learned of this he wrote that he would like it recorded in a proper form. This was agreed and Garter wrote in April 1975 that the fee of One Hundred Pounds would cover a painting for submission to Her Majesty, which he would later retain in his papers, a facsimile copy for the Admiralty Board, and for copying the flag into the records of the College of Arms. He asked if there would be any objection to a brighter shade of red, and moving the anchors apart slightly to make the flag less crowded. Rouge Croix Pursuivant noted that BR20 distinguished between crimson and red, and asked which was preferred. It was decided that crimson (brownish red) was better than red (pillar-box red). In May 1976 Captain E.M.C. Barraclough, who wanted information for the next edition of "Flags of the World", wrote to Naval Law asking if the Admiralty Board had officially adopted the three anchor flag. He added that a friend at the National Maritime Museum had told him that their Board did not like their new flag; "three anchors with three (sic) little ships stuck on top". He was told that the flag was still not formally approved. The College of Arms design for the flag did not arrive at the Ministry of Defence until September 1976. It was submitted to HM the Queen and returned, approved, on 10 November 1976. The flag was formally introduced by DCI(RN)292/77. "Since the abolition of the Board of Admiralty in 1964 the right to fly the Admiralty Flag has been exercised only by HM the Queen as Lord High Admiral and there has been no officially recognized flag of the Board of Admiralty. 2. 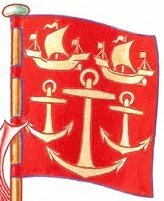 HM the Queen graciously pleased now to approve that the flag of the old Navy Office of the 18th century, three anchors in gold on a crimson field, shall be formally adopted as the flag of the Admiralty Board. 3. The flag is to be flown in HM ships and naval establishments when two or more members of the Admiralty Board acting as a Board are present, and on official cars in which two or more members of the Admiralty Board acting as a Board are travelling. The flag will also be flown on the official cars of Ministerial and civilian members of the Admiralty Board on appropriate occasions." It was first flown at sea on 28 June 1977 when members of the Admiralty Board embarked in HMS Birmingham at HM Jubilee Review. When the Admiralty Board convened without the political members it was known as the Navy Board. Since the three anchor flag had originally been the flag of the Navy Board this led some to believe that the flag was still the flag of the Navy Board, and that the Admiralty Board did not have a flag. The matter was resolved in 2003 when the College of Arms designed a new flag for the Admiralty Board, a vertical gold foul anchor on a red flag, and the 1977 Admiralty Board Flag became the flag of the Navy Board. - the flag of the present Navy Board since 2003. The British expression "First Lord of ......" is used when one of the medieval great offices of state (Lord Treasurer, Lord High Admiral, etc.) is put "into commission." That means it is taken out of the hands of the hereditary nobility and put into the collective hands of a committee that is responsible to Parliament as members of the government. These people are known as the Lords Commissioners of the whatever, and the head of the commission is the First Lord. The post of Lord High Admiral was put into commission in 1628 and stayed so for most of the time up until 1964. The Lords Commissioners, also known as the Board of Admiralty, along with their staff were the equivalent of a ministry of the navy. At the British Ministry of Defence website, it explains that in 1946, the UK created a unified Ministry of Defence, but left the three service ministries (the Board of Admiralty, the War Board, and the Air Ministry) in place alongside it. In 1964, it was decided for reasons of management efficiency to consolidate the three service ministries, including the Board of Admiralty, into a single Ministry of Defence. The Board of Admiralty thus ceased to exist, meaning that the position of First Lord of the Admiralty also ceased to exist. As a result, the position of Lord High Admiral was taken out of commission, and now inheres in the Queen, who therefore flew the Admiralty flag on her yacht HMS Britannia when it was still in commission. Just to confuse things a little, the First Sea Lord is quite different from the First Lord of the Admiralty. The Sea Lords were the top ranking professional naval officers assigned to the Board of Admiralty. The First Sea Lord, or 1SL, is a collateral title of the Chief of Naval Staff, the uniformed head of the Royal Navy. The Sea Lord titles were not affected by the 1964 amalgamation. The full title of the Lords Commissioners of Admiralty makes it entirely clear: "The Commissioners for Exercising the Office of Lord High Admiral of the United Kingdom of Great Britain and Northern Ireland, etc." Mariner's Mirror Vol.22 (1936) p133-160 "Flags in Marine Art" by Cecil King. Mariner's Mirror Vol.38 No.2 (May 1952) p84-105 "The King's Flags" by Cecil King. Mariner's Mirror Vol.43 No.4 (Nov 1957) p267-280 "The Queen's Sea Flags" by A. Peacock. Mariner's Mirror Vol 47 (1961) p212-213 "The Badge & Flag of the National Maritime Museum, Greenwich"
National Maritime Museum Trustees' Minutes. National Archives (PRO) ADM 1/8735/80, ADM 1/ 8746/163, ADM 1/9479, ADM 1/25028, ADM 1/25471, ADM 1/27859, ADM 330/56. British Flags by W.G. Perrin. Flags at Sea by T. Wilson. December 1894, The Admiralty Flag. Both by Rear-Admiral R.M. Blomfield.